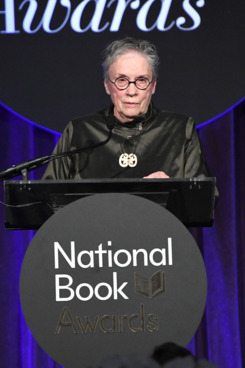 I thank the National Book Award Foundation, the committees, and the judges for this medal. I was surprised when I learned of it and I’m grateful and honored to receive it and to be here tonight, and I thank my editor Nan Graham, for it is her medal too. We don’t live in the best of all possible worlds. This is a Kafkaesque time. The television sparkles with images of despicable political louts and sexual harassment reports. We cannot look away from the pictures of furious elements, hurricanes and fires, from the repetitive crowd murders by gunmen burning with rage. We are made more anxious by flickering threats of nuclear war. We observe social media’s manipulation of a credulous population, a population dividing into bitter tribal cultures. We are living through a massive shift from representative democracy to something called viral direct democracy, now cascading over us in a garbage-laden tsunami of raw data. Everything is situational, seesawing between gut-response “likes” or vicious confrontations. For some this is a heady time of brilliant technological innovation that is bringing us into an exciting new world. For others it is the opening of a savagely difficult book without a happy ending. To me the most distressing circumstance of the new order is the accelerating destruction of the natural world and the dreadful belief that only the human species has the inalienable right to life and God-given permission to take anything it wants from nature, whether mountaintops, wetlands or oil. The ferocious business of stripping the earth of its flora and fauna, of drowning the land in pesticides again may have brought us to a place where no technology can save us. I personally have found an amelioration in becoming involved in citizen science projects. This is something everyone can do. Every state has marvelous projects of all kinds, from working with fish, with plants, with landscapes, with shore erosions, with water situations. Yet somehow the old discredited values and longings persist. We still have tender feelings for such outmoded notions as truth, respect for others, personal honor, justice, equitable sharing. We still hope for a happy ending. We still believe that we can save ourselves and our damaged earth—an indescribably difficult task as we discover that the web of life is far more mysteriously complex than we thought and subtly entangled with factors that we cannot even recognize. But we keep on trying, because there’s nothing else to do. enraged, he flung the book into the fire. I’m ready to believe it. all doomed sooner or later. turns up barking gladly in the last. Go here to watch it. “The happy ending still beckons, and it is in hope of grasping it that we go on.” It is not hope that keeps me going. Because in all honesty, I find my hope is lost. And maybe that’s a good thing. But in its wake comes rage. And maybe that’s a good thing too.